Oftentimes we never really see a full person. We see their work self, their play self, their happy self, or the self they want everyone to see. And oftentimes, as in the case with George Carlin at least, the self that remains hidden from most of the world is the most beautiful and tender side of all. In the years before he died, comedian George Carlin released nearly 15 HBO specials, 20 CD’s, wrote 6 books and made countless appearances in movies and TV shows. In each one of those outlets, he talked openly and honestly about everything from religion to politics, all while staying true to the crochety old-man-style of humor that made him a legend in his own right. But when the shoes came off at the end of the day, Carlin was a very different man. Gone was the hard exterior…gone were the attitudes about Catholicism, voting, aging, and stupid people doing stupid things. Once he got home, back to his comfort zone, back to Sally Wade, Carlin was a cupcake. 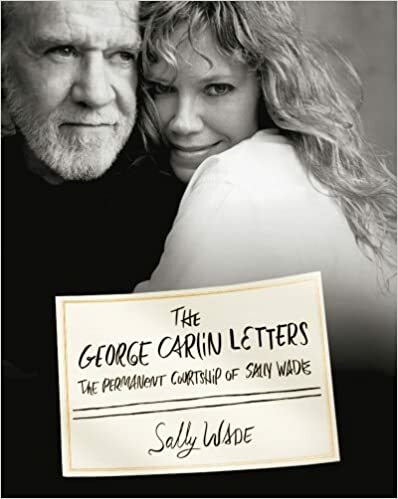 The George Carlin Letters: The Permanent Courtship of Sally Wade is a unique illustrated memoir written by Carlin’s second wife, Sally Wade. Filled with never-before-seen writings and artwork by the late great comedian, woven into Wade’s telling of the last 10 years of their life together, this beautiful book shows the hidden side of a man we all thought we knew. The real George Carlin was a romantic, an artist, a lover. 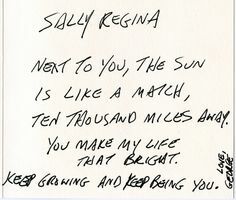 He wrote notes to Sally daily…telling her how beautiful she was, how wonderful she was, how much joy she brought to his life. They shared wild and mystical pipe dreams, dreaming of flying around Jupiter and making it their own. They shared nicknames and created a language only they understood. Their love was real, ever-growing, and so secret and protected. It was a kind of love so many of us only dream of having. Published after he died, The George Carlin Letters show a very different side of a comedian we all thought we knew through and through. Heartwarming, sad, tender, and bittersweet, this book acts as one final love letter from Sally to George…and maybe even a heart-felt goodbye from Sally to George’s fans. This is the REAL side of the man we all loved…his soft underbelly that he kept so hidden from the rest of the world. In the most beautiful way possible, Sally helps readers see a side of Carlin only she witnessed, giving us a close, intimate look into one of the most romantic stories never told. Looking for a new book to read? Check in every Friday for a “Bee Happy” post, where I share reviews of books I’ve read or other book-themed lists.